As I mention in “Friends and a Goal” I’ve reunited with several in-active Eastern Loggers to work on layouts and to have a setup at the October NMRA Division Show. For 2015, we plan to take my Sn2 Free-mo modules. We settled on a simple “U” shape configuration as shown in the image below. To that we can add the full length turntable or possibly complete the loop as show with simple sections. 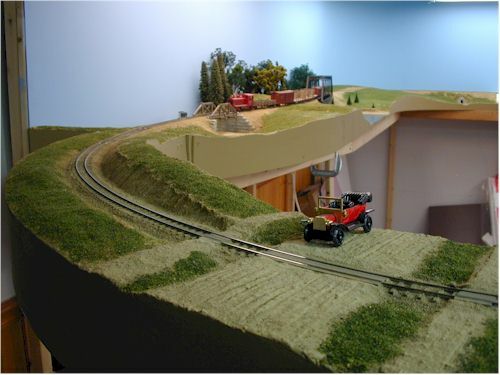 I still have the duck under from my first Sn2 layout. It 90 degree curve that is 8″ wide and 4″ think. It could be used in combination with 1-2 additional sections to complete the loop. The road crossing and cut in the image below is that duck under. The Main St. crossing in Strong. In the background, a train is approaching from Phillips. This was the site of a head-on accident where #8 tipped over on the embankment. As a result of the wreck, the ball signal was moved to the other side of the Strong station for better visibility. The duck under is two 2″ thick pieces of foam. with plywood ends and masonite sides. Quite sturdy, very light and easy to handle. Had I considered this technique, it might have been manageable to make the reversing loops with the Junction module. That’s not possible now, as I’ve sold the module and I hope it prospers. The “U” plan is nice as it is a manageable size, fitting in 1/3 of my basement room. Speaking of my basement, TNT (that is what we call our group) worked on my ceiling again last night. We’re nearly finished. Thanks guys! I promised that the next time we meet at my house we’ll set the modules up and try running them. A fun meeting to assess the situation and for them to learn more about 2-Foot, SR&RL, and S-scale. This entry was posted in Drawings and Plans, Free-mo, TNT. Bookmark the permalink.